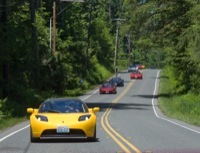 On June 12, 2010, the Northwest Tesla Roadster Club and the Seattle Tesla Store organized a full day of fun: a group appearance at the Exotics @ Redmond Town Center car show, a drive through the rural backroads east of Seattle and lunch at the Seattle Tesla Store. Early arrivals at the Exotics @ Redmond Town Center. Ferg's hitch and bicycle rack. Our Roadster with Dave's mesh top. Cathy and Carl looking at the mesh top. After the car show broke up, we had the lot to ourselves and started the driver meeting. Cathy going over the route with everyone. Stopped at the Duvall Safeway to regroup and chat. Rural King County highways make for great driving for all sorts of quiet, efficient modes of transport. Mary and Cathy taking cross photos. Crossing the I-90 bridge between Mercer Island and Seattle. At the end of the drive, the Seattle Tesla folks hosted a lunch for us.